With nearly 30 years of global travel expertise, the caliber of REI Adventures’ local guides has always set apart the company from others in the industry. 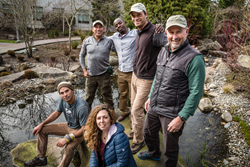 To honor those who received some of the highest praise from guests, the company has named six international experts as “Top Guides,” an annual recognition that honors the best of the best. "The relationship between our guides and guests is extraordinary,” says Cynthia Dunbar, REI Adventures general manager. REI Adventures’ Top Guides are determined from independent customer reviews, which are available on the travel company’s website. The travel leader also gives significant consideration to guides who best represent REI’s values and brand, and partner with the co-op in strengthening the company’s travel offerings around the world. Award-winning REI Adventures has been a global leader in worldwide guided active adventure trips since 1987. As the travel business for national specialty outdoor retailer REI, the company offers unique itineraries focused on sustainable, human-powered outdoor adventure including: hiking, biking, kayaking, climbing and more. Guests experience iconic destinations as guides take them off the “beaten path,” and provide opportunities to explore a destination, get to know the local people, their culture, the flora and fauna and discover things they would not be able to duplicate on their own or with another travel company. REI members receive a special discount price on most trips. For more information, full itineraries and trip reviews provided by guests, visit http://www.rei.com/adventures. REI is a specialty outdoor retailer, headquartered near Seattle. The nation’s largest consumer co-op, REI is a growing community of 5.5 million active members who expect and love the best quality gear, inspiring expert classes and trips, and outstanding customer service. REI has 143 stores in 35 states. If you can’t visit a store, you can shop at REI.com, REI.com/outlet or the free REI shopping app. REI isn’t just about gear. You can take the trip of a lifetime with REI Adventures, a global leader in active adventure travel that runs more than 170 expertly crafted itineraries on every continent. REI’s Outdoor School is run by professionally-trained, expert-instructors who teach beginner- to advanced-level courses about a wide range of activities. To build on the infrastructure that makes life outside possible, REI invests millions annually in hundreds of local and national nonprofits that create access to–and steward–the outdoor places that inspire us.